Myss Lafunky's Blog: Your Faith - Living or Dead? How was your weekend? I trust you had a lovely weekend. Yesterday was an interesting day for me; my faith was tested severally with the things I had discussed. In fact, I had to plead for mercy of God as I was reminded that my faith was not alive whilst I slandered and God was not pleased with my actions. I was also reminded of the scripture that says: "We all stumble in many ways. For if we could control our tongues (If anyone is never at fault in what they say), we would be perfect and could also control ourselves in every other way (James 3:2 NLT version)." In addition, I humbly learned that I must not be self-righteous when correcting others or admonishing people as other believers' strength may be my weakness and my strength may be their weakness. Therefore, we are all work in progress. Thank you Jesus for this learning. Be blessed by this article that the Holy Spirit instructed and directed me to write. What good is it, my brethren, if one says I have faith but does not have works? Can that faith save the person? 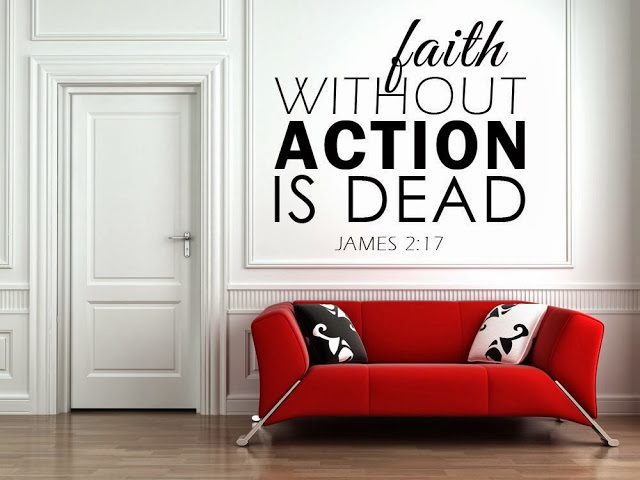 (James 2:14). Or should we ignore the scripture that states that we should let our light shine before others, that they may see our GOOD WORKS and give glory to our Father in heaven? (Matthew 5:16). From my personal experience, practising good works unto the Lord can be costly, i.e., financially costly, emotionally costly, time costly, etc. However, when we practise good works both in the open and secret, even when they are extremely difficult, God sees them as sacrificial obedience unto Him and He rewards us accordingly at the right time (Gal 6:9). There was a time that I had an opportunity to lie about a situation but I stated the truth albeit I was penalised for sharing it; I was emotionally hurt but the Holy Spirit comforted me. I knew my honesty was in line with God's word and it was a sacrificial obedience unto God. Also, there was a time that I had twisted an information and made it not 100% accurate. I knew my faith was not alive during the act; it was dead. Thank God for His mercy that forgave my transgression. I would like us to examine ourselves and assess how alive our faith is. Is your faith only alive when you are praying? Or when you are reading the Word of God? Or is it only alive when you are in church? How alive is your faith? Is your faith alive when you have told that woman that you are just 10 minutes away from meeting her at that particular location but you know that you are 45 minutes away? Is your faith alive when you made a promise to pay that debt that you owe but, deep down in your heart, you know that you won't be paying back? Is your faith alive when the usher in church directs you to sit at a different row from your choice but you gave her the worst of looks? Is your faith alive when you paid a bribe to someone in order to by-pass a few steps? Is your faith alive when you falsely condemned that sister or brother? Is your faith alive when you have chosen not to support your family financially as you believe all your income must go to the church at all times Or to buy the latest SUV? Is your faith alive when everyone around you is scared of you because your level of anger is second to none even though you are full of anointing? How alive is your faith? How balanced is your faith? Verse 7 - To godliness brotherly kindness, and to brotherly kindness love. Verse 8 - For if these things are yours and abound, you will be neither barren nor unfruitful in the knowledge of our Lord Jesus Christ. One of my friends said: "let's not be good, self-controlled, patient and godly Christians that exhibit all the gifts of the spirit but ignorant of God's word due to a deficiency in faith and lack of knowledge." Be the Christian whose life and actions preach Christ. The Bible says in the book of Acts 4:33 that: "And with great power gave the apostles witness of the resurrection of the Lord Jesus: and great grace was upon them all." I pray for the Great Grace and Great Power of God to be released upon you so that your faith can be alive in every situation in Jesus' name. You can also pray the prayer of mercy; for God to have mercy on you wherever your faith hasn't been alive. May we not profess to know God, but in works deny Him, may we profess our Christianity in words and actions in Jesus name. Thanx for the post sis. Day by day may we live by faith. A very deep reminder that our faith is alive and gets stronger each time we stand for the truth. Thanks sis, God bless you for this and God help us as we strive to keep our faith alive.